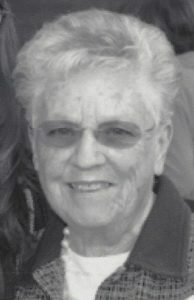 At 89 years Oct. 11, formerly of Revere in Port Charlotte FL passed peacefully in the love of her God & her family. Beloved wife of the late Joseph M. Mulligan. Cherished mother to Nancy Munroe & her husband Robert B. Munroe of Port Charlotte FL & Patricia A. Kelcourse & her husband Matthew W. Kelcourse of Newport News VA. Devoted grandmother of Meghan Munroe of Tallahassee FL & Kylie Munroe of Gainesville FL. Loving daughter of the late Mildred H. Seifried. Family & friends are invited to attend the Funeral from the Vertuccio & Smith Home for Funerals, 773 Broadway (Rte. 107) REVERE on Thurs. Oct. 18 at 9 a.m. Followed by a Funeral Mass in the Immaculate Conception Church (corner of Beach St & Winthrop Ave) Revere at 10 a.m. & immediately followed by interment in Woodlawn Cemetery, Everett. Visiting hours are Wed. only Oct. 17 from 4-8 p.m. in the Funeral Home. Parking available left of the funeral home. Wednesday, October 17th from 4:00 p.m. to 8:00 p.m.